SeaCOM provides the tools necessary to verify the installation and operation of Sealevel asynchronous serial products. Click to view the Asynchronous Serial products supported by SeaCOM. Sealevel’s SeaCOM enhanced serial driver makes using the features of our asynchronous serial products easy. In addition to being completely compatible with the Microsoft Windows Serial Driver, SeaCOM also makes use of advanced UART features of our board-based adapters without requiring changes to your software application. The user can preconfigure advanced features in the SeaCOM driver using Windows Device Manager. The advanced features of SeaCOM allow your Windows application to automatically control the transmitter tri-stating when using RS-485, configuring appropriate devices for different electrical interfaces (e.g., EIA-530), and optimizing advanced FIFOs to make the most efficient use of the resources available to the application, all happening in the background and without requiring application support. The Sealevel SeaCOM driver for USB to serial adapters give you similar device configuration capabilities. Since our USB serial ports appear as traditional serial ports to the operating system, your application requires no changes or modifications. The user can preconfigure advanced features in the SeaCOM driver using the included Port Manager .NET utility. You can alias baud rates, change USB Latency Timers and configure other USB related timers and buffers to optimize the driver for your specific application requirements. For supplemental information, read the Advanced UART and USB Serial Support article. Download the SeaCOM Software Suite for Windows. WinSSD is a full featured serial diagnostic utility for Windows. WinSSD allows the user to perform external loopback tests, toggle modem control signals and transmit test pattern messages. In addition WinSSD provides terminal emulation, bit error rate testing and throughput monitoring. 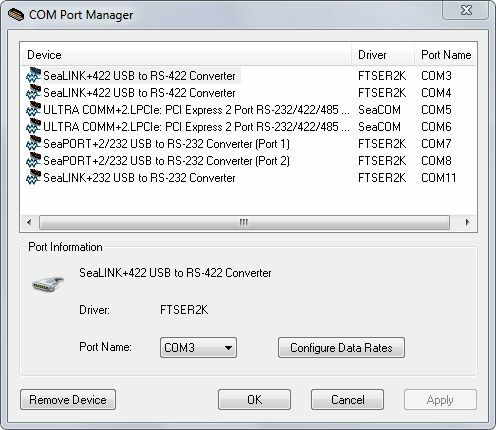 Port Manager is a utility included with SeaCOM that allows the user to change the Windows COM number, assign COM drivers to a specific port, and select custom data rates for Sealevel USB serial products. Port Manager is installed during the installation of SeaCOM. With Linux 2.6 and UDEV, the kernel supports the direct use of UART-based devices with the drivers that are included in the kernel sources. These changes greatly simplify the external configuration of Serial devices in Linux. Sealevel’s PCI Express, PCI, PC/104 and ISA serial adapters are compatible with the 8250 kernel serial driver. In many cases, the adapter will automatically work when recognized by the kernel driver. For other cases, the Linux SeaCOM software package includes instructions for configuring a system and Linux drivers using setserial or by including the adapter into kernel driver. Sealevel’s USB serial adapters are compatible with the built-in Linux FTDI_SIO kernel driver. In many cases, USB serial adapters will automatically work when recognized by the kernel driver. For other cases, the Linux SeaCOM software package includes instructions for configuring a system and Linux drivers using boot-time parameters, kernel driver load-time parameters, or by including the adapter in the kernel driver. With Linux kernels 2.6.32 and later, other runtime options are also available. UDEV can be used to automate these processes. Linux SeaCOM software also contains source code for several utilities and example applications that demonstrate communication using standard and 9-bit serial adapters. The included utilities are also useful for configuring electrical interface modes in supported hardware. At the heart of most serial ports is a UART chip that provides the asynchronous communication capability. Over the years, the UART has evolved to offer many advanced features, including complete control over when an interrupt is generated. While most applications will operate using the default configuration, the Sealevel SeaCOM software suite provides access to these advanced features allowing you to configure your system for optimal performance. These advanced features are accessible in the Advanced tab in Windows Device Manager. Read the Asynchronous Advanced UART and USB Serial Support article for full details on the advanced features available in the SeaCOM driver. For USB serial adapters, you can configure the advanced settings in Windows Device Manager. SeaCOM allows you to configure the COM port number assignment, optimize transfer timing and sizes appropriate to your application as well as set timeouts and other miscellaneous options. The WinSSD utility allows the user to select the COM: port number, set data rate, data bits, parity, stop bits and flow control. This utility gives you the ability to perform simple data loopback tests, modem control signal tests and Bit Error Rate Tests (BERT). Additionally, you can use it for simple terminal emulation and log incoming and outgoing data to a file. For more detailed information see the WinSSD Overview article. 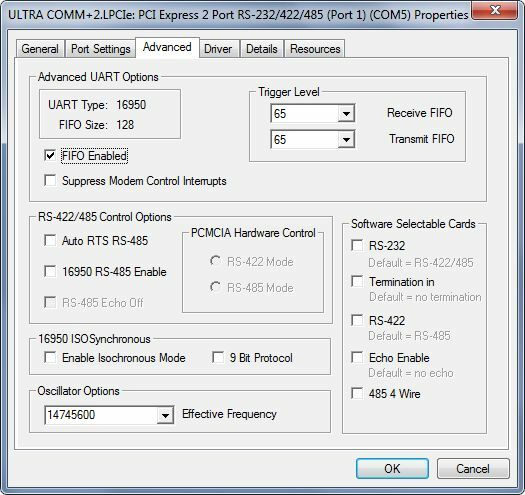 The Port Manager utility helps manage serial ports by allowing you to change drivers, renumber serial ports and alias data rates as appropriate to your serial device. The main screen of Port Manager displays a list of all COM ports in the system and lists the driver associated with each device. If necessary, you can change the driver associated with a serial port (i.e., change an on-board serial port to use the SeaCOM driver). The standard Microsoft driver (associated with the on-board COM1) that is installed with Windows is called ‘Serial’ (serial.sys). The Sealevel driver associated with UART-based serial adapters (PCIe, PCI, PC-104, ISA, PCMCIA, etc.) is called ‘SeaCOM’. The Sealevel driver associated with USB serial adapters is called ‘FTSER2K’. To easily change the COM port number associated with a serial device, click on the device name in the list to highlight it. Click the Port Name drop down box and select the new COM port number. Sealevel USB serial adapters allow you to alias baud rates effectively tricking your application into running at a different baud rate. If your software application only allows you to select a standard baud rate, such as 9600 bps, but you need to run at 125000 bps, you can click ‘Configure Data Rates’ and substitute your desired custom data rate for the 9600 bps data rate.